This is a ripoff of kalina/Flyk's guide found in MSO for people that can't find stuff in the new not-technically black new SE bar. Chat used to have a link on the top bar, next to your user statistics preview. 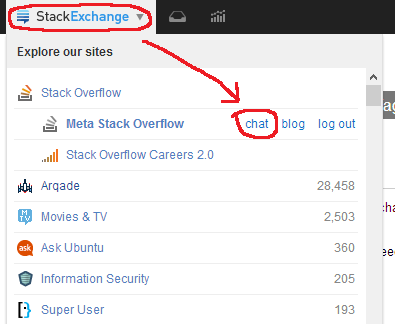 The new chat link is available by clicking on the "Stack Exchange" logo for the site whose chat rooms you want to access and clicking on "Chat" next to the site you're currently on. You still need to browse to individual sites to be taken directly to that site's chat page, but accessing any sites' chat page will still allow you to find chats from different sites if you wish to access them this way. If the current site has a blog, then there is a link to it next to the “chat” link. Otherwise there is a “blog” link pointing to the Stack Exchange staff blog. The list of available privileges including a breakdown of how much reputation you need to get to the next privilege used to be available by opening up your user statistics preview and clicking on privileges. The same privilege view is still available on your profile page and within the help center. To access this page, click on "help" to open the help menu and go to "Help Center". From here, under "Privileges", select "View a full list of privileges you can earn". How can I get to a site's meta? 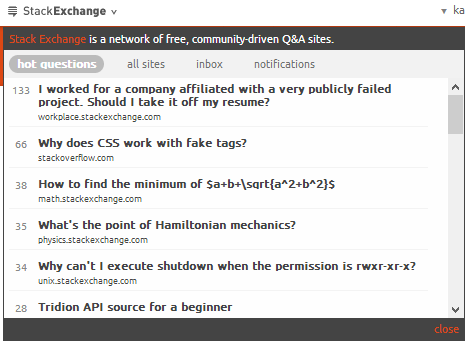 The meta site for an individual Stack Exchange site used to be available directly from the top bar. 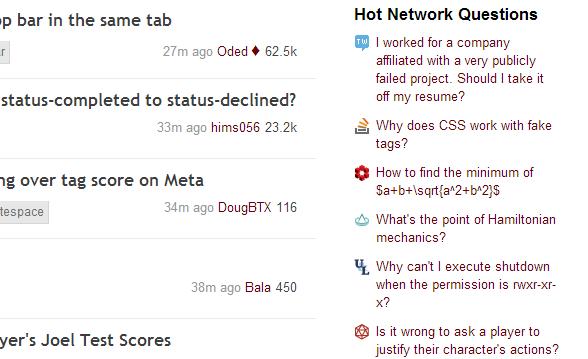 Meta is now on the Stack Exchange menu, like chat. Simply click on the "Stack Exchange" logo for the site whose meta you want to access and click on "Meta" to get to the meta site. Additionally, as a second method of getting to a site's meta, you can access meta from the "help" menu on the main site, by selecting "help" to open the help menu and then clicking on "Meta" to get to meta. What happened to the "about" link? The about link used to link off to the "Tour" page and used to be available from the old top bar, next to "meta" and "chat". The Tour page is now available by clicking on "help" to open the help menu followed by clicking on "Tour" to access the tour to Stack Exchange page. 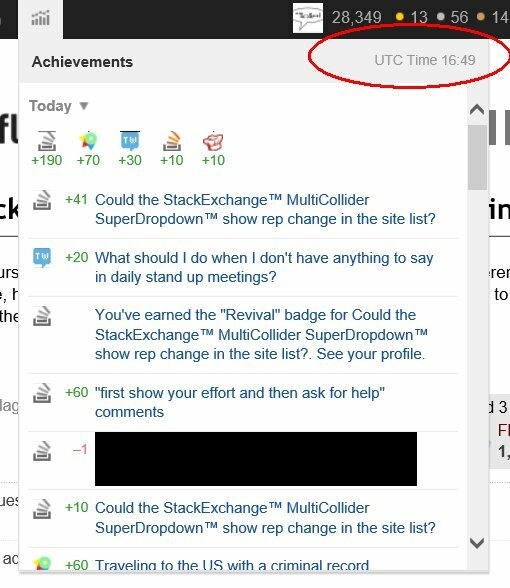 The logout button is now located in the list of sites accessible from the top left “StackExchange” button, on the third line after the chat and (if applicable) blog links. Where's the username hover box now? How can I see recent changes (reputation, badges, vote counts, revisions, favorites) now? 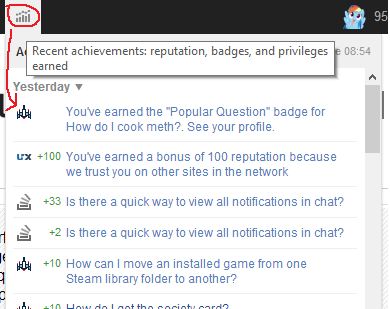 Formerly, clicking on the little down arrow next to your user statistics preview on the top bar would open up a breakdown of how much reputation I've earned, any recent badges, and statistics on my recent voting habits. How can I see all this information now? To view today's reputation total and your reputation history on a site, go to your profile and click on the “reputation” tab. To view your vote totals for the day, week and month, go to your profile and scroll down to the “Votes Cast” box in the right-hand column. To view the history of revisions to your posts on a site, go to your profile and click on the “responses” tab then on the “revisions” sub-tab. To view your the history of favorites change on a site, go to your profile and click on the “favorites” tab. To view recently earned badges, go to your profile and check the “Badges” area (scroll down and look in the right-hand column). The more verbose "activity" link that used to be on the old drop down linked to your profile. To access the full list of your activity on a site, go to your profile and click on the "activity" tab. Where did "Hot Questions" go? Where did "Recent Tags" and "Recent Badges" go? These were where "Hot Questions" is now. The list of recent badges is on the badges page, which you can get to via the "badges" link at the top of the page (under the nav bar, alongside "users", "tags", etc).